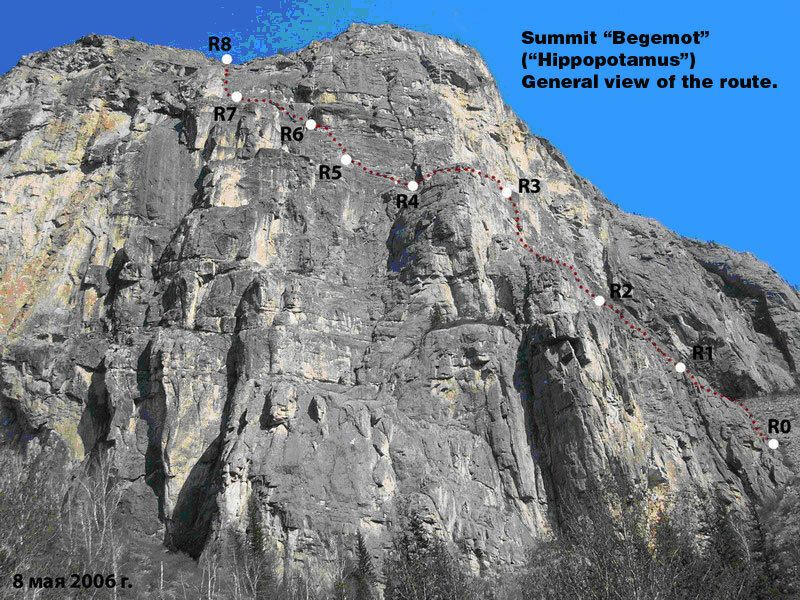 Report of the team of the Altai Krai about an ascent to the summit “Begemot” (“Hippopotamus”) (~1700 м .) along the South-Eastern Wall. The route of 4B grade of difficulty passed for the first time. Members of the team: Parshin Anton, Nikolaichuk Alexander. The Altais, canyon of the Chua River . Summit “Begemot” (“Hippopotamus”) (~1700 м .) along the South-Eastern Wall. 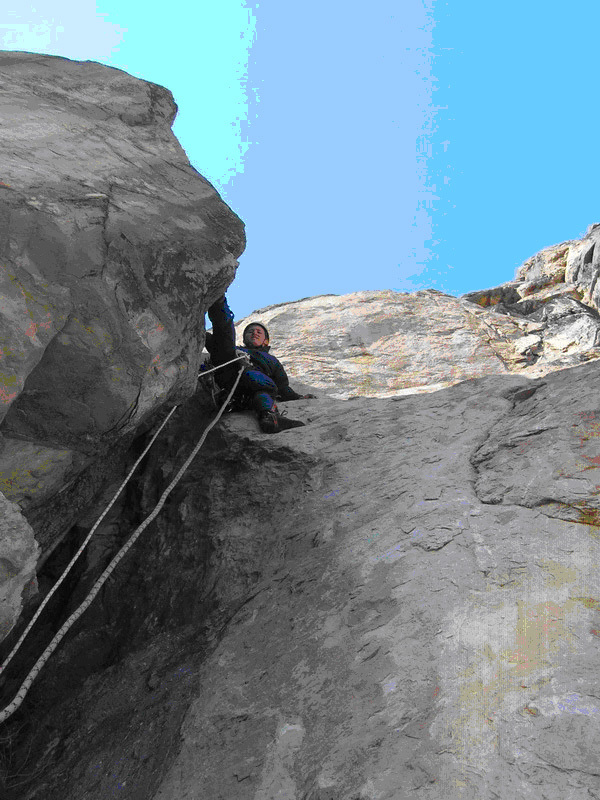 4B grade of difficulty is suggested, the route was passed for the first time. Character of the route – rocky. 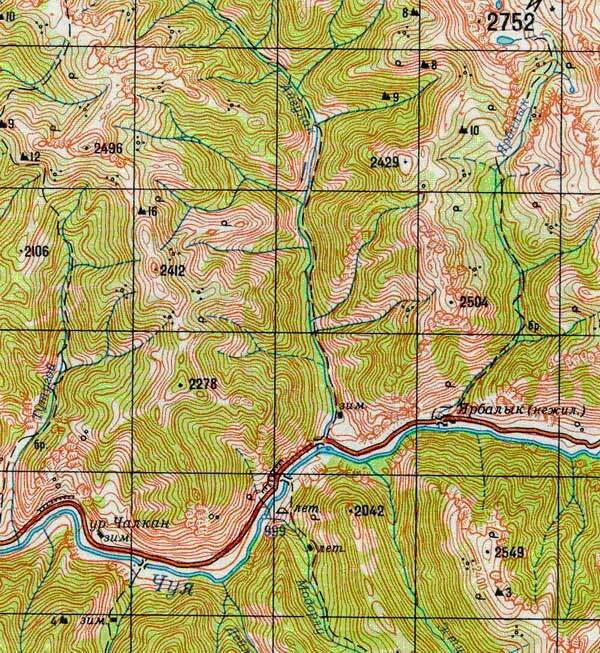 Climb of the route – 250 m .
Extension of the route – 380 m.
Extension of the strips of V grade of difficulty – 40 m.
Extension of the strips of IV grade of difficulty – 120 m.
Extension of the strips of III grade of difficulty – 60 m.
Average steepness: of the main part of the route – 35 degrees. Of all the route long – 20 degrees. We used on the route: rocky hooks – 3 items nuts and stoppers – 52 items. 7. The team was working on the route for 11 hours. Members of the team: Nikolaichuk Alexander. 9. Trainer : Parshin Anton . Time we reached the top: 6:45 p.m. the 8 th of May 2006. Time we returned back to the Base Camp: 8:10 p.m. the 8 th of May 2006. 11. Organization: Altai State Technical University . Technical photo with mapped route and strips. The summit is located in the side spur of the Aigulax range. Approach to the route starts from the place for camp in front of rapids Begemot (about 755 km of the Chuisky high road). It takes about 15-20 minutes to get to the bottom of the route from the road. DEION OF THE ROUTE STRIP BY STRIP. R0-R1 – The beginning of the route is near a small birch. From it you have to climb in the direction of a big chimney along the system of walls and ledges. 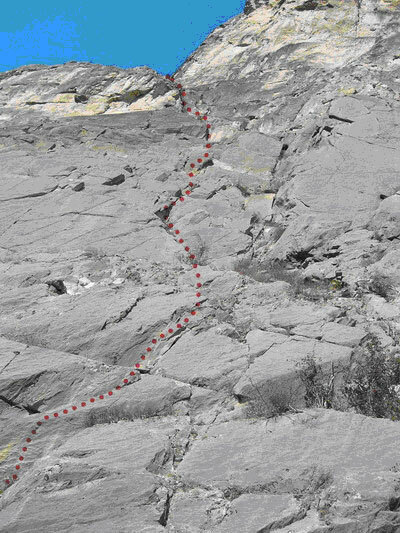 It is not difficult to climb there: grade of this strip equals II-II+. Station can be made on cam devices. Extension of the strip equals 45 m . We used 3 cam devices to pass the strip. R1-R2 – Along the same ledges and walls ( 30 m ) you have to climb to the beginning of an interior angle of 5 meters high, grade of difficulty – IV+. After this angle there is a big ledge at the bottom of the chimney. Station can be made on the “heavy hammer”. We used 3 cam devices and one stopper to pass this strip. 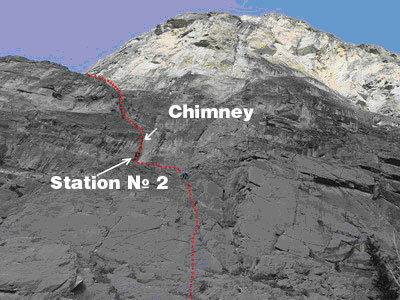 R2-R3 – You have to climb along the vertical chimney of 12 meters high, V grade of difficulty. 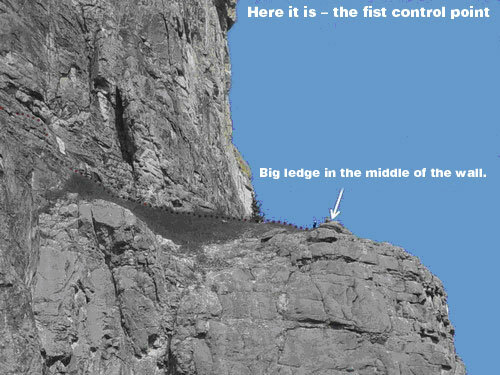 After it you should move along wide interior angle up to a big ledge ( 35 m ), IV grade of difficulty. On the ledge there is the first control place for notes. Station can be made on the tree. We used 4 cam devices and 2 stoppers to pass this strip. R3-R4 – From the ledge you have to hold the general direction up and to the left, to the cedar. 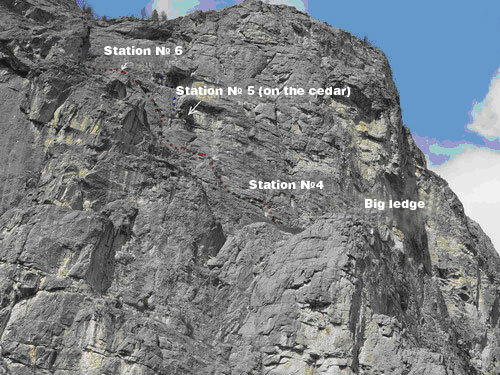 There is an 8 meters high wall of IV grade of difficulty, after you will have passed it, you should traverse to the left along not wide ledge for 30 meters , grade of difficulty of the strip – III. Station can be made on cam-devices. We used 4 cam devices, one hook and 3 stoppers to pass this strip. R4-R5 – You have to climb along the interior angle straight upwards, grade of difficulty of the strip – IV, this angle is 15 meters long. After it you should climb for 20 meters in the direction of the cedar along unnoticeable ledges. Station can be made on the cedar. We used 4 cam devices. 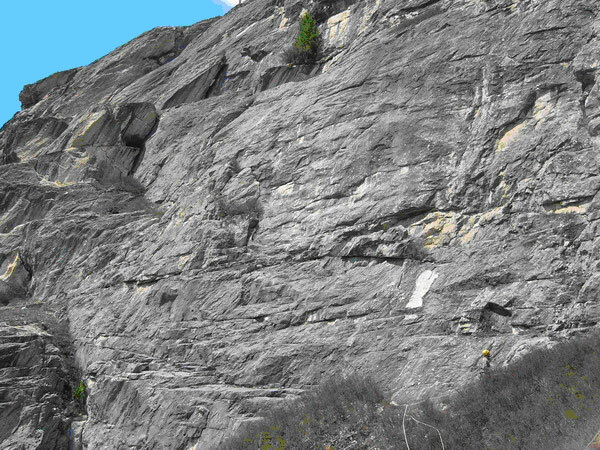 R5-R6 – From the ledge you have to traverse to the left along the ledge and then to climb along the interior angle, rounding flaked piece of rock. Station has to be made on stoppers. Difficulty grade of the strip – III-IV. Extension of the strip equals 35 meters . R6-R7 – You should climb along noticeable wide, in some places overhanging interior angle. It is difficult to pass this strip, grade of difficulty of it is V. Belay can be organized with the help of middle and large cam devices, on the last meters – with the help of middle stoppers. Extension of the strip is 50 meters . We used 6 cam devices, 7 stoppers to pass this strip. Upper part of the wall.